Many business leaders see cross functional collaboration as the key to innovation and optimal business performance. Almost everyone agrees that it's good to have more cross functional collaboration, but not every business has devoted the effort to creating conditions that are likely to result in more of it. If you find yourself in this position, here are a few simple strategies that can help set the stage for a more cohesive relationship between various parts of the organization. 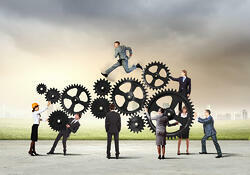 In most organizations, there are a number of individuals who are natural connectors. To borrow a word from junior high, these employees are “popular.” They are the perfect individuals to involve in your cross functional collaboration efforts because it likely comes naturally to them, and because where they go, others will follow. If you are creating a cross-functional team to solve a particular problem, for example, be sure to include one or more influencers. The people in your organization who know the most about particular processes, products, or disciplines can help to accelerate your cross functional collaboration efforts. Paring a subject matter novice with an expert is a great way to educate the less experienced person and give the expert a new point of view at the same time. No one is likely to be an expert in everything, so the opportunity for employees to learn from others is enormous. The first two strategies involve deliberate coordination, but not all collaborative moments must be planned. Often an impromptu conversation in the break room can lead to a breakthrough. Companies that are great at cross functional collaboration design the work space and the work day to encourage these random interactions. Google, for example, is famous for intentionally creating lines in the cafeteria and snack areas so that employees from different departments will have an opportunity to chat. All of these other strategies can be undermined if employees in different parts of the organization are recognized and rewarded at cross purposes. It is not uncommon that financial incentives are based solely on department goals. This sets collaboration against the employee’s own pocketbook and achieves predictably poor results. In order to improve cross functional collaboration, set goals and incentives that require it. Cross functional collaboration is about mutual commitment toward common goals and the joint effort necessary to achieve them. It is in every business leader’s best interest to lay the foundation for a united approach to innovation and improvement. These strategies can help.